The Dragon Griaule, the vast immobile creature, sleeping or presumed dead, around whose bulk has grown cities, has been familiar to readers of Lucius Shepard since "The Man Who Painted the Dragon Griaule" first appeared in The Magazine of Fantasy and Science Fiction in December 1984. Shepard has returned occasionally over the last twenty-five years to regale us with more stories of Griaule's influence on the lives of the people who live on his body, or in the cities nearby. 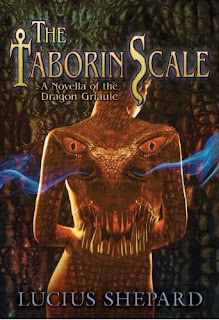 The Taborin Scale, published in an elegant edition by Subterranean Press, is the latest entry in the growing series. This novella concerns the numismatist George Taborin, who by means of a scale from Griaule finds himself and a prostitute, Sylvia, transported to what appears to be an earlier time when Griaule was young. Griaule is herding people to no apparent purpose. Taborin rescues a young girl called Peony from abuse, and with Sylvia the three form an odd kind of family. Shepard excels at depicting unusual people in even more unusual circumstances, and his prose is as elegant and shimmering as ever, casting its own spell over the reader just as Griaule's presence works its influence over Shepard's characters. The Taborin Scale is yet another example of one of the best modern fantasists at the height of his powers.